Love the art... as far as I know, this is the only way to give a minion spell-protection. I'm always surprised how annoying this is. Anybody think this will combo well with Emperor Thaurissan ? Turn 9 combo with Mimiron's Head. GOOD. GAME. *Implies you have mechs on the board, like 2 Target Dummies. The act of targeting is distinct from the act of a spell affecting a target. Wee Spellstopper has no impact on Spellbender. Cool.. might use one of these. Looks like shes from WildStar. Leave it to the mighty little gnome to protect big, clumsy powerhouses like Giants from spells, it's perfect to put between two beefy taunts too. If you think about it for a moment, the card itself kind of has build in "Spell Taunt" and I see no problem with it eating a big removal spell while your other threats remain unharmed. I also quite like the artwork. I know most people probably aren't fans of the asian, "anime-ish" style but I think it's perfect for a female gnome like this. Pretty cute. But still, this Spellstopper is easily stolen by Cabal, easily sniped by Kodo, or just simply silenced. Mages don't have Sword of Justice, nor can we consistently count on obtaining Finicky Cloakfield from the Spare Part-generating cards. That means if we want to play around Cabal and Kodo, we have to sacrifice 2-4 slots for Shattered Sun Clerics and/or Defenders of Argus. Anyone got a better idea for protecting Spellstopper? The art gives reminds me of "just like one of my Japanese Animes" meme. A damn fine card, but I can't help like they gave it to the wrong class! Still a great card. Objectively better than Ancient Mage. Solid card. Could coin it with Antonidas as well. But it can be played one turn before side to a belcher ;-). It's not a battlecry. I know it's not a Battlecry but would your opponent let you have it on the board? If you play it, it means that you have something important to drop next turn. 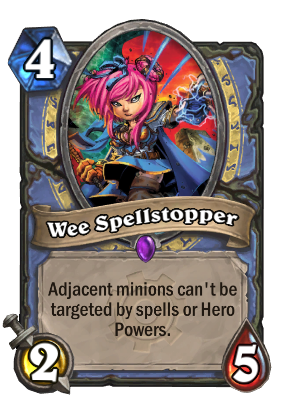 It's a signal for "KILL IMMEDIATELY"
And now they used their removal for Wee instead of that important card. Mission accomplished. Yes because every player will automatically get a 5/5 at the end of each turn and an empty board is physically impossible right?